Here's this weekend's sketch. It's my weekend today (working tomorrow) so I figured I'd upload early. If you have time to play along, feel free to leave a link or use the keyword FTL31 at SCS when you upload! 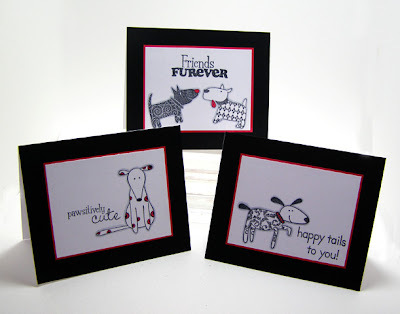 For the patterned piece on the right, feel free to use patterned paper or stamp your own. That's what I decided to do. I saw the avocado and aqua mist colour combo somewhere and it reminded me of some patterned papers I saw somewhere else (sorry for all the vagueness!). I decided instead of going through my patterned paper stash I would just stamp my own. It really is one of the best things about stamping, since you can colour match it exactly to other items in your collection. I used the CAS03 sketch challenge from SCS to make this card. 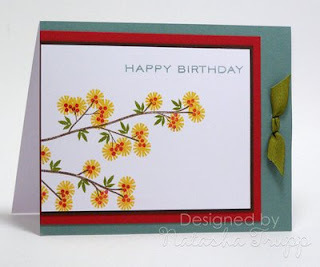 The colors came from the GinaK Stamp TV color challenge: Always Artichoke, Apricot Appeal and Pumpkin Pie. 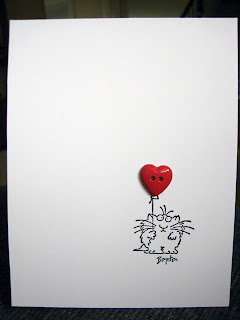 I love this sketch and I can see making this into a set of note cards with it. 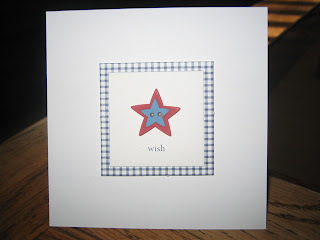 I colored the image with my markers then stamped it onto the PaperTrey Stampers Select card stock. I colored in the flowers (outline stamp) with my markers. 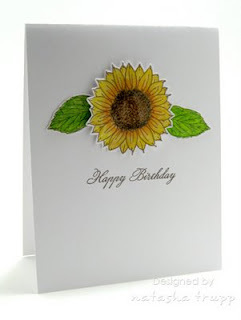 I used a Cuttlebug border embossing folder on the Always Artichoke layer. Finished it off with the MS butterfly punch and some pearls. 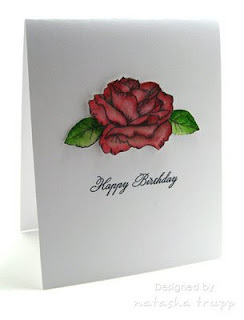 Supplies: Stamps - Endless Creations; Ink - SU! 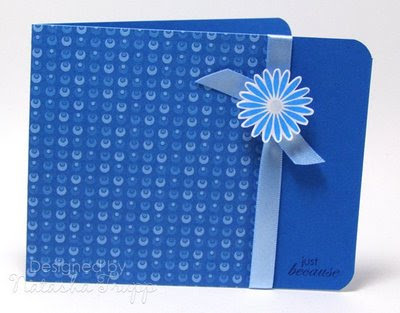 markers; Paper - PaperTrey, DCWV; Misc - MS Butterfly punch, Cuttlebug Border Embossing Folder, pearls, glue dots. I kept things extremely simple this week. I just received some new patterned paper, so this layout is all about showing that off! Some basic measurements for you, if you like: the patterned paper part is 4.25x4, leaving 1.5 inches for the rest of the card base to fill. I placed my ribbon on the patterned side, not in the middle. It doesn't really matter where you place that dividing strip though. First off, yay for 3 day weekends! Woot! This last week was particularly trying with the ice rain on Monday and Tuesday, and then the brief warm-up, and then finally back to a mostly winter-like -15 or so. I felt like using the Teacher's Apple set. But I really wasn't feeling the red, I thought I'd make a Granny Smith apple. I inked up the stamp first with Spring Moss, then applied a bit of shading with Ripe Avocado. I added in brown for the stem, then I realized that my colour scheme was set- Chocolate, Moss, and Avocado. 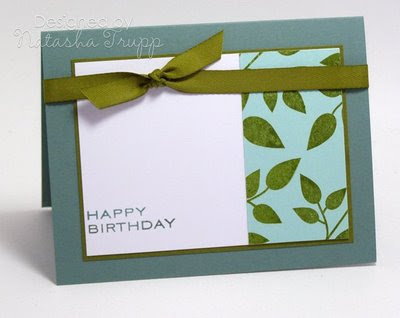 I thought using ribbon, but I wanted a really sharp, clean edge, so I went with thin strips of cardstock. 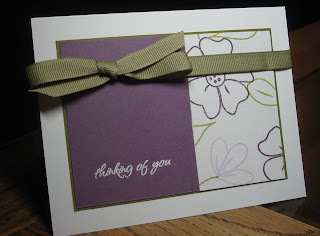 You get a similar effect and used some of the spindly scraps that were next to my paper cutter. Time for another sketch! 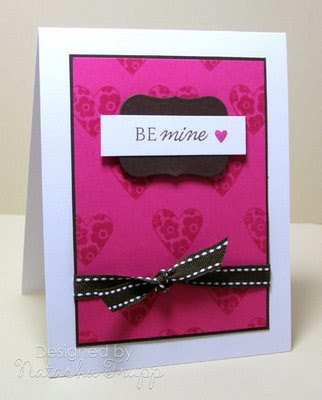 This one was inspired by one of my favorite CAS stampers, Dawn McVey . In case you've been out of the loop, she's got a stamp set debuting tomorrow evening at Papertrey Ink. 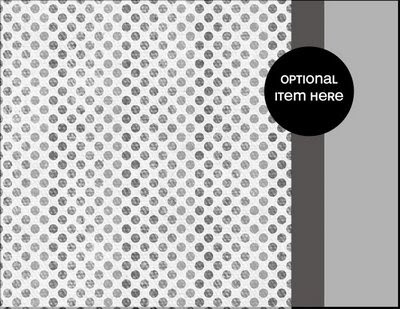 I really liked what she did with the damask image to make background paper. It's nice to have a card focus on a pattern. 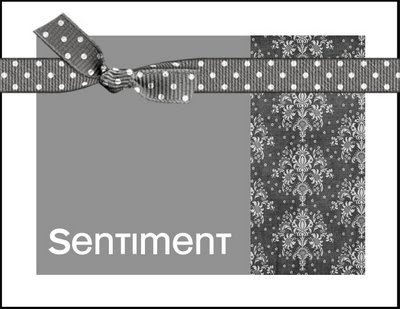 All it needs is a small sentiment and your choice of embellishments. I kept my card themed in the spirit of Valentine's Day. 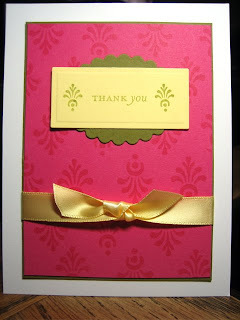 I really liked the effect of the fancy label underneath the sentiment on Dawn's card. I used the Label One Nestabilities for that. If you cut the squares in half, you can match them back up to make a more rectangular shape. 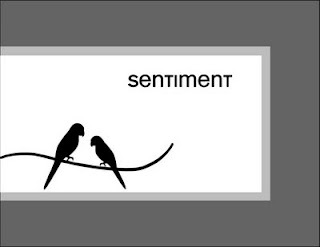 It worked out well for this, since I knew I'd be placing the sentiment piece over top. The seam is completely hidden. The rest of the card seems pretty self explanatory. I added in one extra layer. I just can't help myself, I love having that 1/16'' border between my main image panel and the card base! 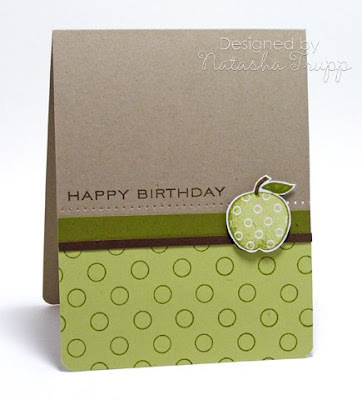 I originally made this card for the PaperTrey Color Challenge. 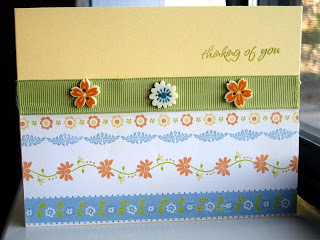 I used the flourish stamp from the With Sympathy set. 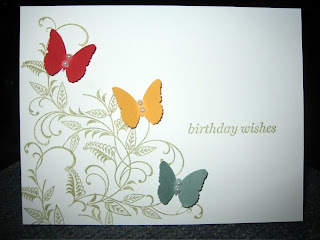 I punched the butterflies witha Martha Stewart punch and attached them with glue dots. I then added the small half back pearls to the butterflies. The sentiment is from PaperTrey as well. This card took about 5 minutes to create. Supplies: Stamps - Papertrey; Paper - PaperTrey; Ink - Versamagic Spanish Olive; Misc - Martha Stewart Butterfly punch, Pearl stickers, Glue Dots. I needed to do 3 things tonight. 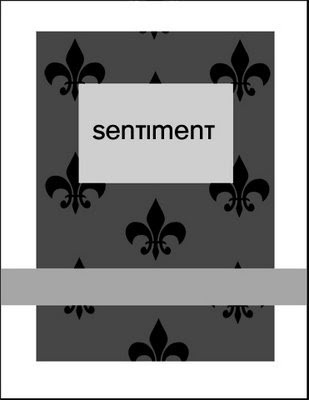 Make a sample card for my Fall-To Sketch (On a side note, someone asked about what this means. A fall-to layout is something you use frequently, it's kind of like a back-up. When you don't want to do something complicated, you can fall to these simple sketches! 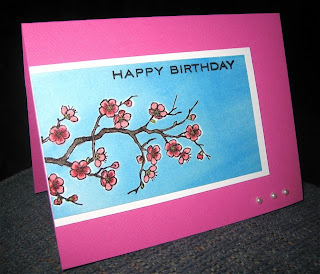 Make a birthday card for a good friend of mine. I quickly set out to combine these into one card and I was successful! So first up, here's the sketch. For my main panel I went with 3.25x4.5. Feel free to change that up! The sketch is more like 2.25x3.5. Here's my card. I see now I didn't quite adhere to the sketch. My panel is much bigger and I don't have all 3 sides of the bottom panel being the same width. Oops! That's the beauty of a sketch, it provides a guideline. For the flowers/branch, I started out with Out on a Limb. Next I inked up the dotty flowers in Pure Poppy. Then I grabbed a flower from Text Boxed, inked that up in Summer Sunrise and went over the dots so it would kind of appear that the dots were the flower centers. Finally I added in leaves, using the small leaf image. I am in a monthly alphabet swap and this month is W. I got these 3D stickers at Archivers when I was visiting this swap group in Iowa last summer. W is for WISH. 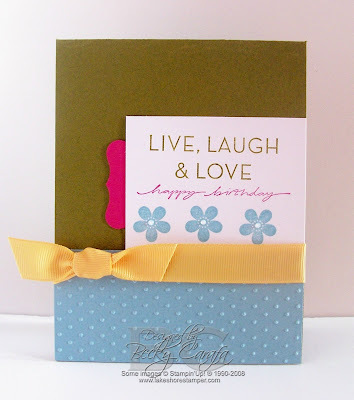 No stamping involved here - I am feeling kind of guilty about that! But I think it is so cute! Supplies: Paper - PaperTrey; Misc - Making Memories 3D sticker. 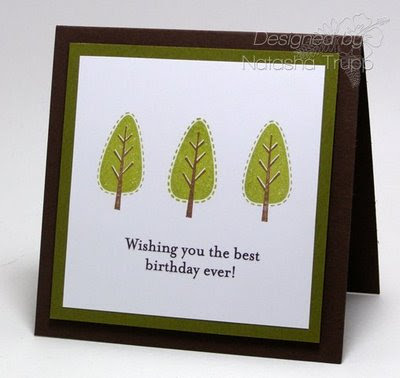 I've got two cards for you today. They are barely more than one layer. I really like these flowers and wanted to showcase just that. For my first card I was in the mood for some pencil crayon colouring. To bring a little more pop to the flower I glazed the center with crystal effects. Now I know that it has a drying time of more than 10 minutes, but if it's your last step, then it doesn't add to your total card time :D For this card I wanted to take a stab at watercolouring. My watercolour paints have been highly neglected. I guess I wanted to prove to myself that I could still manage that medium. 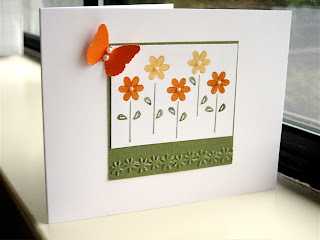 On both cards I stamped and coloured the flowers and leaves on separate paper, then cut those out and popped them up with pop dots. I was quite pleased with both cards. There's something so satisfying about a pop of colour against all that white space.